The Refinery has been *extremely* busy of late – which is no bad thing. One of the various commissions we have had have been written word. 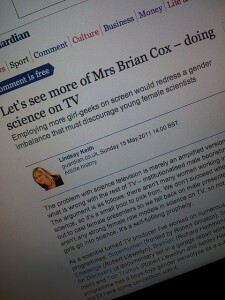 Lindsay was commissioned to write a piece in the Guardian about the dearth of female science presenters. Post-commission it became clear that there was not, in fact, a dearth of female science presenters so much as a dearth of commissioning editors putting them on screen.